I know I’ve possibly overshared these two little beauties throughout the past few weeks but I just wanted to wrap it all up by showing you the final finished quilts in all their glory before being posted to their final homes! And aren’t they just lovely!! Let’s start with the Granny Squares Block Quilt. This was the first time I had ever attempted to make a Granny Squares Block. I had always looked at it and thought, ‘Geeze, that looks complicated!’ But after delving more into how the block was pieced together, I realised just how incredibly simple it was to make and I literally jumped straight into it! You can check out the block tutorial I made right here! I loved matching the adorable Cotton+Steel Basics fabric with some of the similar coloured Art Gallery Fabrics (AGF) that I already had in my stash. The direction and shapes in the prints added such a great depth of character, movement and sweetness to the quilt so much that every time I stepped back to observe it, a squeal of delight came out my mouth! 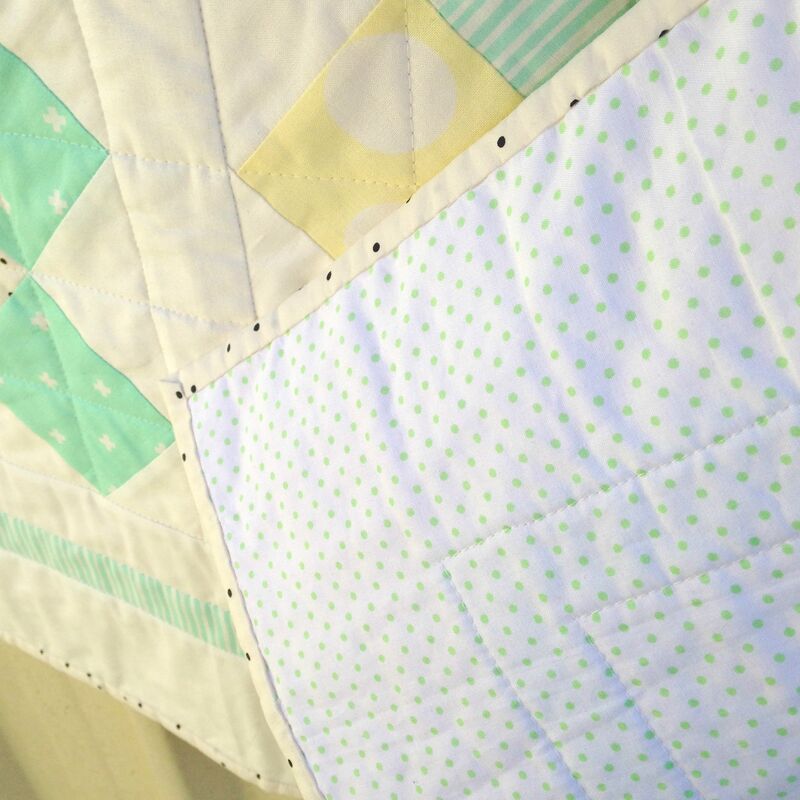 Then, the way that I quilted it made me fall in love even harder! I decided to do a grid-like-pattern that was sewn off-set to the squares in the block. To make it easier for me to get sharp and precise straight lines, I used my Clover Hera Marker to ‘score’ or ‘bruise’ my ‘to-quit line’ on the top of the quilt. I then simply followed this line as I quilted, resulting in this lovely even design! 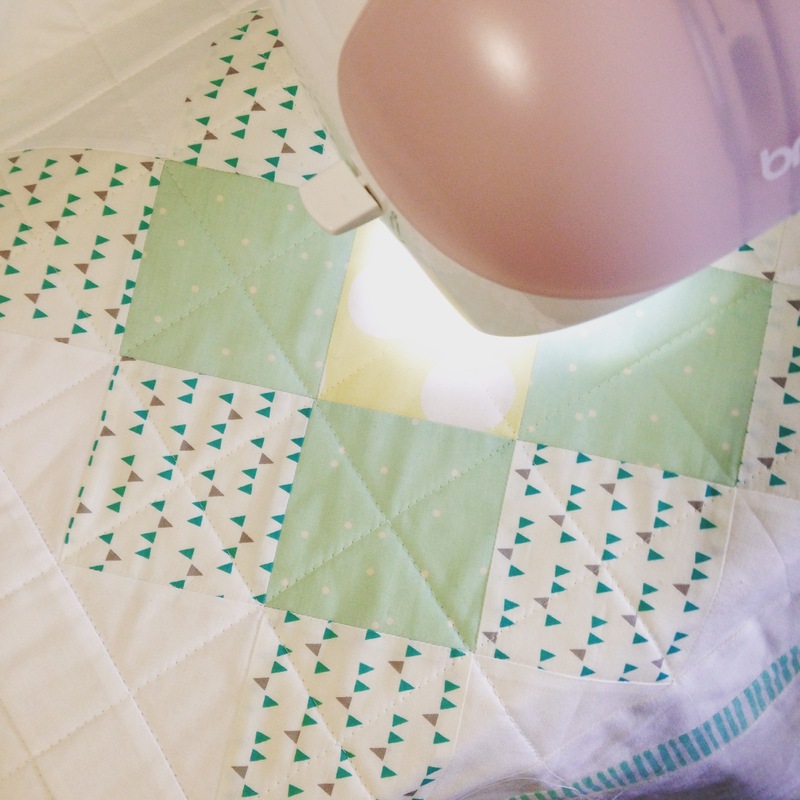 When basting this quilt, I also came across a beautiful batting that I’ve always wanted to use, but always thought it was too expensive to buy. The one that I was recommended to use by my always-so-helpful friend Bitza at my local Spotlight, was a bamboo/cotton blend batting made by Legacy that didn’t cost the earth or empty out the balance of my bank account! It was such a delightful batting to work with! Super soft to the touch, lightweight and dreamy, easy to baste and quite literally glided like butter through my machine! Oh. My. Gosh. I was in love! It’s going to be really hard to now go back to using an all cotton batting! To finish this little delight, I backed it with a darling lime pin-spot fabric and used the leftover ‘Hello Bear’ black spot fabric from AGF for the binding. It simply came out perfect! Oh. 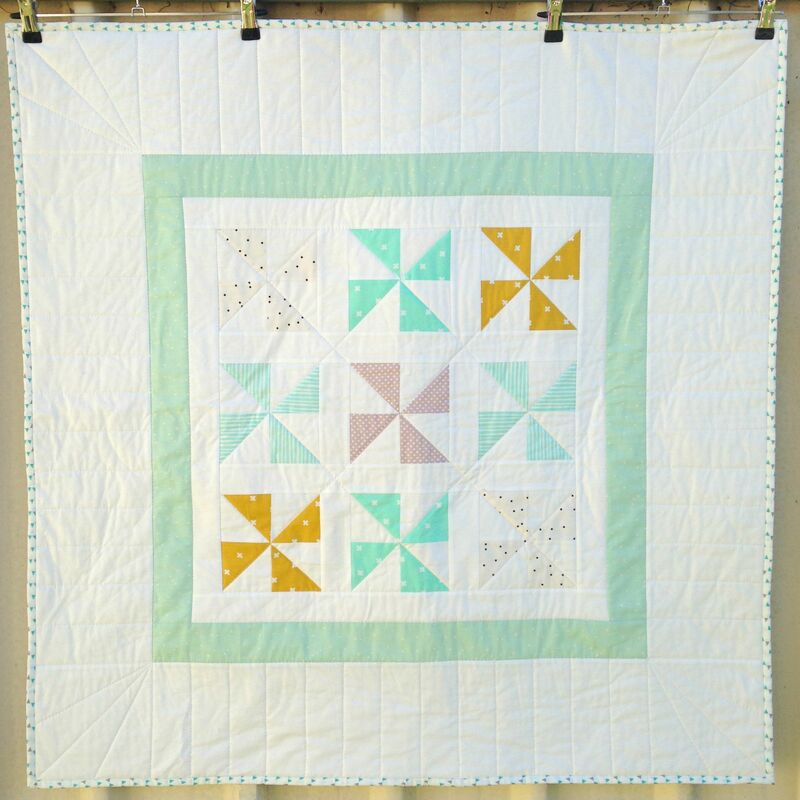 The Pinwheel Quilt! This came together so quickly and perfectly that I could almost cry at the ease of it! 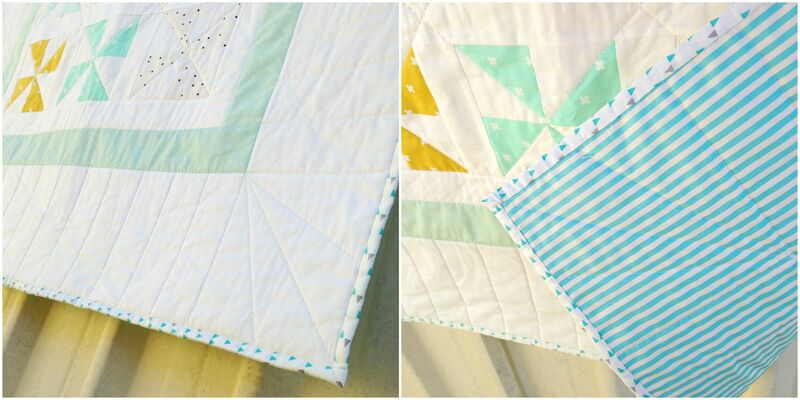 I always love a good little pinwheel and I think they’re just so ideal for little kid quilts! They’re super-easy to piece together and are the perfect block to use up all of those leftover HSTs you’ve got floating around your sewing room! You can check out the tutorial for this block here! 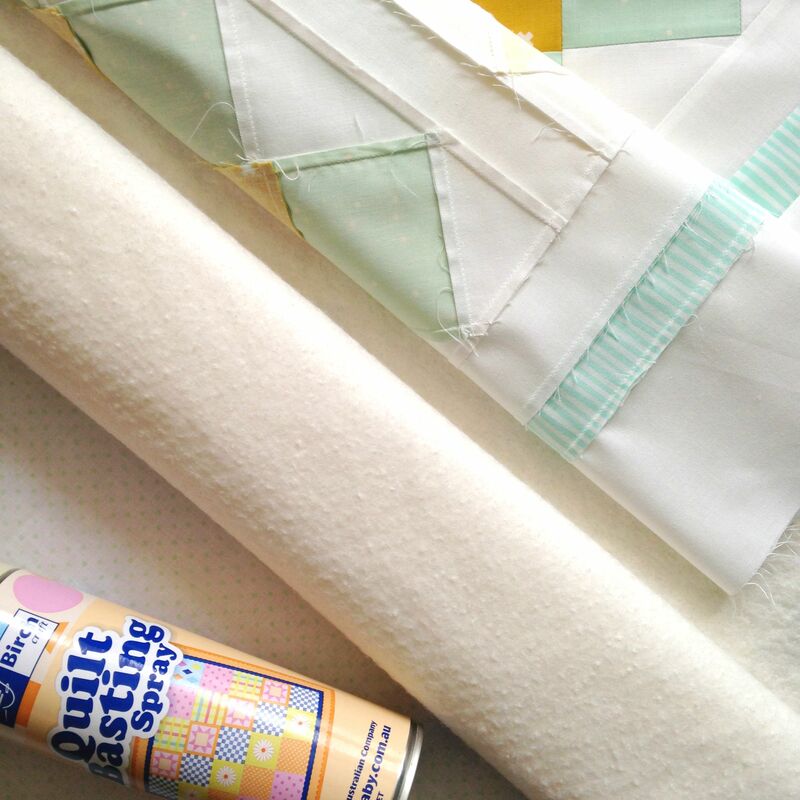 Again, for this quilt I used a mixture of the Cotton+Steel and AGF fabrics paired with an off-white solid. 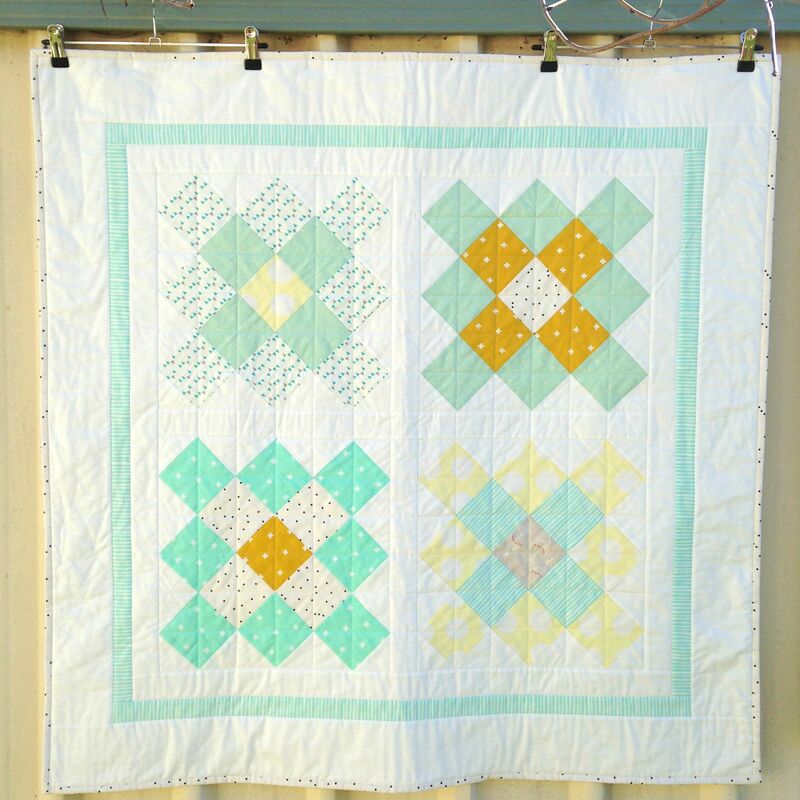 I also chose to incorporate another dominate type border sash around the blocks to ‘frame’ the main focus of the quilt. 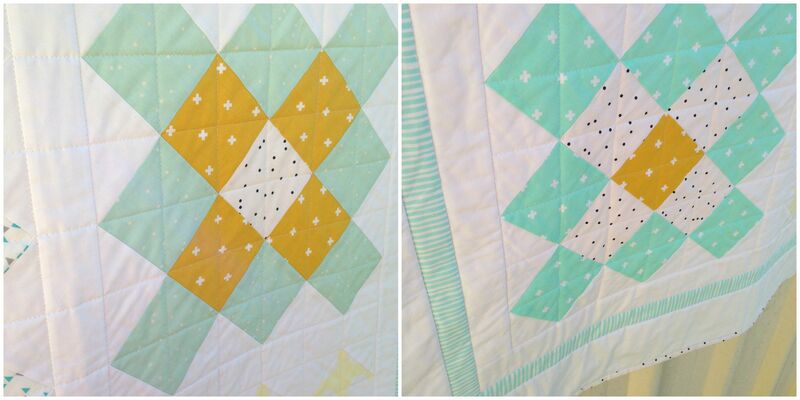 With this quilt, I tried my best to really ‘echo’ or be inspired by the shape of the pinwheel in my quilting. 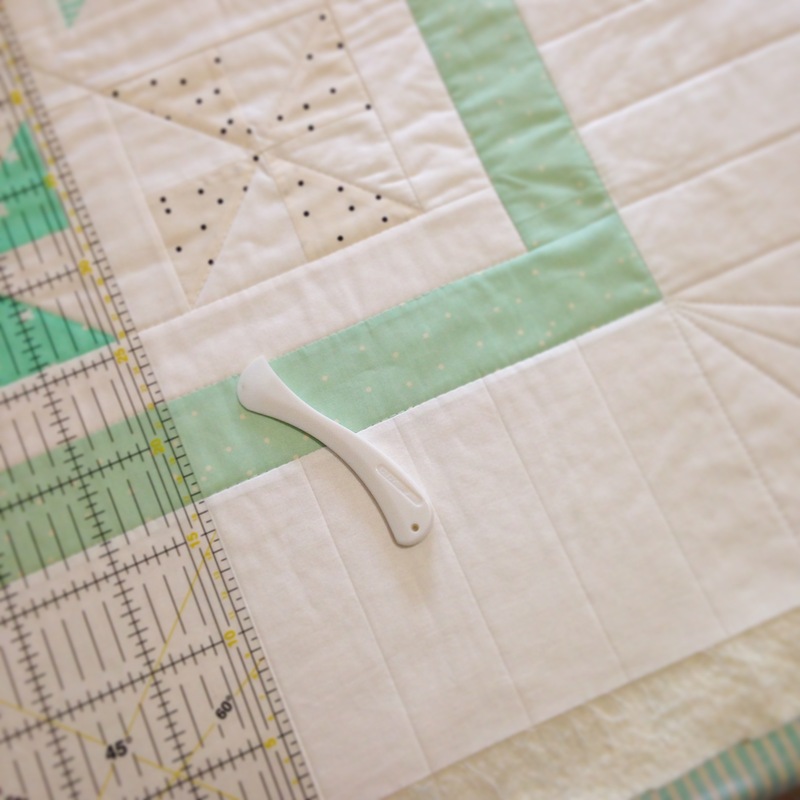 As you may know by now, I love to quilt my quilts using straight lines. And with this, I always love to challenge and stretch my self with the different ways I can do that by exploring direction, shape and density. I think you can really see that with this quilt, especially around the outside border and corners. (BTW: I love doing those little fan-like-designs in the corners, they look so Art Deco-y!) To help achieve the beautiful lines in this quilt, I again used my Clover Hera Marker to create lines in the right positions before quilting over them. To finish this little lovely, I backed it using a teal and creamy white stripe fabric and used a AGF fabric with little triangles on it for the binding. I’ve had so much fun making these gorgeous little quilts and I’ve loved sharing every single step along the way with you! 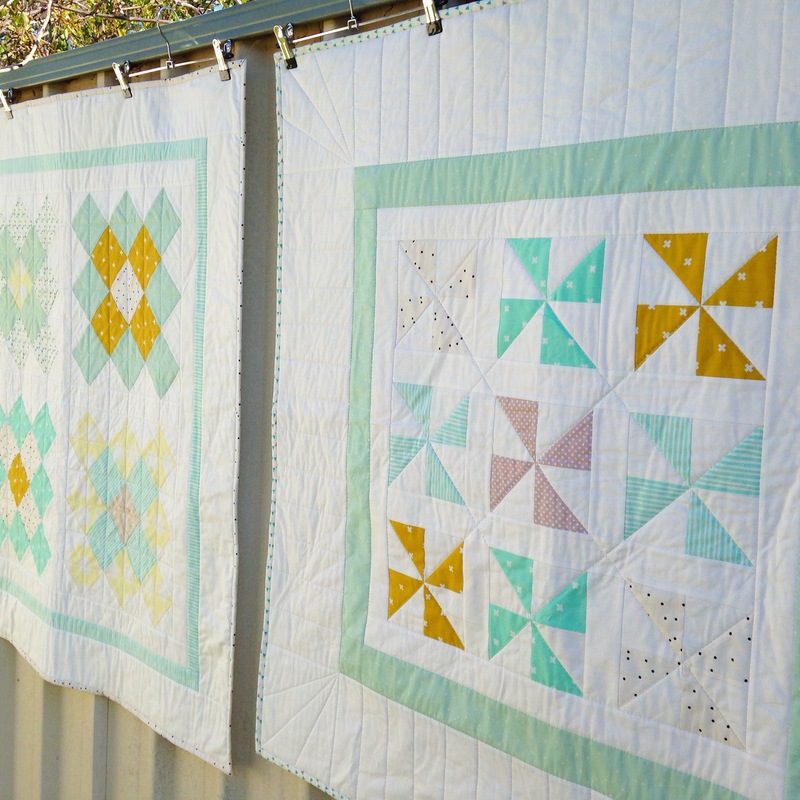 It also makes me cringe-worthy happy that I’ve even inspired some of you to make these blocks and turn them into beautiful quilts for yourselves! So now, let’s all say ‘cheers’ and wish the lucky little bubbas and mummas-to-be all the best!! Previous PostAn Update From My Sewing Room… #4 Next PostRJR Supreme Cotton Fabrics Blog Hop! They are both dreamy. I can see a baby or small child sleeping in them. Great tutorial. 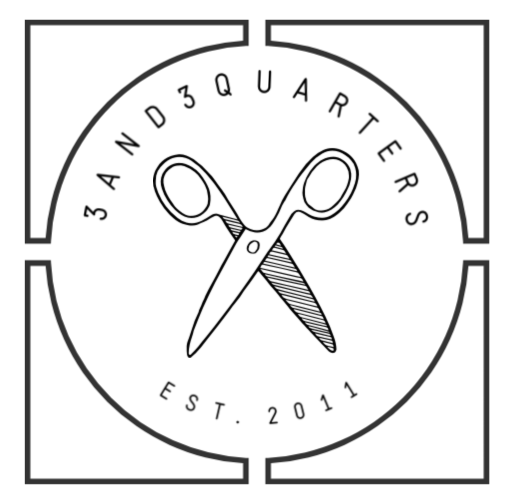 The quilts are darling, thanks for the tutorial. 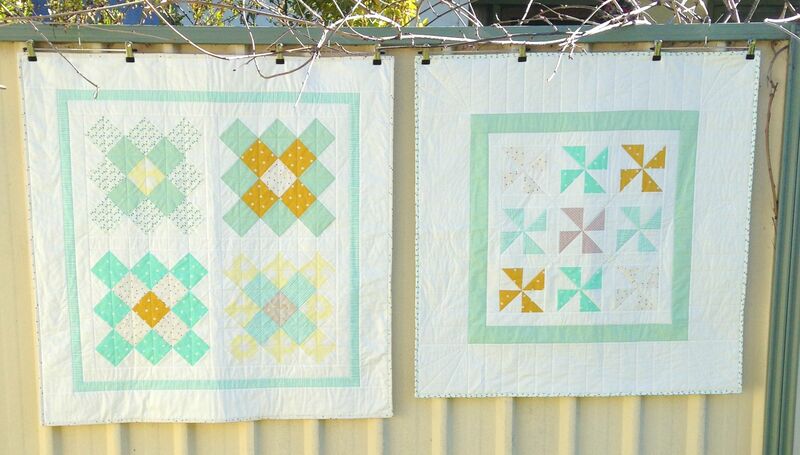 Simply beautiful quilts that will no doubt be treasured for ever by their new little owners. Well done!